When Mad Max 2 was released in the early 80s, it followed an already good film by making it bigger and better, expanding the universe and everything that made the original a blast by tenfold. That’s what I desire from a sequel that has to make existing characters do something more than go through the same motions again – they need a grander task and adventure than the first film. This has been seen with other science fiction franchises, going as far back as Frankenstein (1931) to Bride of Frankenstein and Star Wars to The Empire Strikes Back and for me, Alien and Aliens. I’m happy to say we have it again in Mad Max: Fury Road. It’s not quite the quantum leap from the first film to the second, but it’s satisfied the thirst that Beyond Thunderdome did not quench many moons ago. In short, Fury Road is all you could realistically want from a Mad Max movie in the age of digital film. If you demand the rough physicality of cars speeding along from the original film, you are on the wrong track, as the cars are at least 7 times more bulky now. 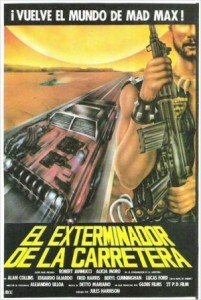 If you demand a modernized version of Mad Max 2, you are getting much warmer. We get nice nods to the series and other films of its ilk from the past, But I’m getting ahead of myself. Let’s get into plot. Fury Road takes place well beyond thunderdome, where we find Max quickly imprisoned by a new gang called the War Boys who number in the hundreds. These black metal-esque looking scrawny drones look like a hybrid between the slaves in the Smashing Pumpkins video for “Bullet With Butterfly Wings” and their lead singer Billy Corgan in the “Ava Adore” video. That’s not the only connection to rock music, as Max resembles Rob Zombie early in the picture, and later, freaks in the film appear to be long lost members of Slipknot. I’m not even going to go into detail about the vehicle that includes a thrash metal guitar player to rally the troops. Anyhow! The pale-faced goons are lead by Immortan Joe played by Hugh Keays-Byrne. Keays-Byrne is the only prominent cast member returning from the previous films, playing Toecutter in ”Mad Max”. This reappearance confuses me a bit, so I’m going to casually go back and forth, referring to him as both Immortan Joe and Ghost of Toecutter. Immortan Joe rules his fortress from the cliffs, where he commands the War Boys who number in the hundreds. Immortan Joe enlists the next best new character in film, Imperator Furiosa (Charlize Theron), to gather more supplies from neighboring towns. Unbeknownst to him, Furiosa has taken some hostages and has her own plan to escape from his rule. After a wild chase that sees a return of the cars from The Cars that Ate Paris (1974), Max manages to meet up with Furiosa and the two make an uneasy truce to get them away from Ghost of Toecutter Immortan Joe who is in hot pursuit. 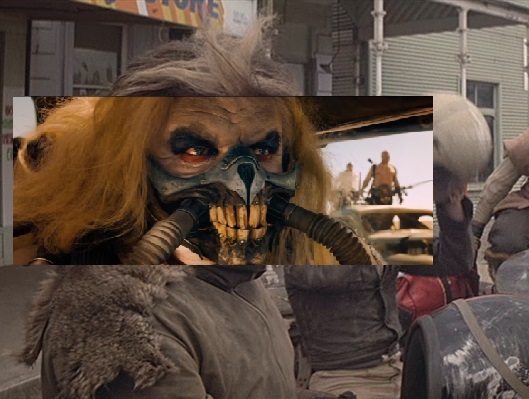 Even worse for Max and crew is that Immortan Joe has teamed with other gang leaders, with appropriate Mad-Max names like The Bullet Farmer and The People Eater. We’ve seen these characters in earlier art design for the film, and I’m happy to state that they not only look the part, but the acting is sharp and without a bad performance throughout. Each character gives just the right amount of camp and comic-book intensity to their respective roles that it would be more silly if these people were not driving spike-covered monster trucks. The Cars that Ate Paris live again! Speaking of looks, if there is one thing that remains in memory from Mad Max 2 or Fury Road, it’s the art direction. Fury Road introduces a new vehicle or two per chase sequence. Each one looks like it was constructed from things we might see in a scrap yard in real life, but with an over-the-top makeover that would make the average monster truck driver drool. Even greater is that these vehicles are all real, not computer-generated blobs that perform impossible physics. I wish I could comment more on the look of the scenery and vehicles, but I viewed the film at a pre-screening event which was shown in 3D. Fury Road was post-converted into 3D and makes some visuals feel unusually out of place, such as muzzle flare effects and the occasional burst of flames. This ain’t Avatar, Gravity, or even Jackass 3D. Don’t see it in 3D! Is the film flawless? Not really. Longtime purists of the series might call foul on Tom Hardy’s lack of screen time to show off the Mad Max character. Mel Gibson’s role of Max in the earlier films was always the stand-out performance, probably because he’s the only character who isn’t given any goofy faces to make. I’ve really enjoyed Tom Hardy in some previous films like Bronson and Lawless , but he is not given as much time for us to delve into the Mad Max character, and almost feels like the side-kick in his own film. Thankfully, the new character is just as tough and wild as Furiosa, and gets her own Mad Max-esque storyline of loss. I can understand a fan’s disappointment with not seeing as much Max in a film called Mad Max, his name is in the title after all! Personally, I’m much more happy to see a new character rather than see Max go through the same problems for a third or fourth time. My only gripe about Furiosa is that her reaction to her group of young friends did not hit me quite as hard as lesser events in the film, such as Max’s annoyance at seeing others driving his car, or even Immortan Joe quickly turning his car to avoid crashing into one of his wives. Not that all important scenes with her lack an emotional tug, but each one should hit hard, especially for a character so prominent. The final, major issue I have with the film is not one I’ve read in any early reviews; it involves how the film was shot. The original films have a rough and raw feel that actual film gives to a movie. We can tell there is a lot of digital tinkering going on in this picture with the hot orange scenes within the desert and the dark blues of the day-for-night shots, which reminded me more of the tinted scenes from Murnau’s Nosferatu than anything resembling a scene shot at night. Not sure what was on Miller’s mind with this stuff. Fury Road should sucker-punch audiences who regularly devour the Disney-Marvel flicks or the Fast and the Furious franchise, and definitely feel more than satisfying for people who’ve waited for this film for over a decade. All I desired was a film that felt like it was made by the maniacs who made the first two films, and I received my healthy dose of the bizarre, perverse, and generously entertaining Mad Max world. Not unlike The Littlest Hobo, Max is shown leaving his accomplices after coming to their aid at the end. I look forward to see where he travels and who he meets next. (Mad Max that is, not the Littlest Hobo).